Discover the Secret to Building a Real Sustainable Internet Business -Fast! Have you ever wondered what it would be like to have a real online business? One that is profitable? One that you know is repeatable? One of the big things I am realizing lately is that despite the large number of “shiny objects” there are out there, promising huge traffic, to get subscribers and get people to your website, there are even more people than ever feeling fed up and frustrated trying to figure it all out. You would think that with all the information available to help you get started and building a profitable online information business, that it would get easier, not harder! And I have realized that the reason for this is that operating and creating an online business is really simple – much simpler than all the gurus would like you to think…. It really isn’t as hard as they want you to think it is. They want you to think it is really hard because they want you to buy tons of stuff from them and tons of coaching, and get on continuity programs, etc. etc. etc. By the way – if you are in any continuity programs right now and you haven’t used the material in at least one month, then get out of them. You are wasting your money. Next – they want you to think it is really tough so not only will you buy their stuff, you’ll think that they are really smart! But are they really an expert? Now of course you need to know some basic things. You need to understand some basic concepts. You need to have something to sell. You need to have a site to sell it on. You need to have a way to get people who don’t buy to get on your list. You need to get people to your site. But the gurus will have you believe that there is something magical about being successful – it’s easy to get drawn into believing it! I did when I first started out online! However, there was something missing from these “shiny objects”. There was no teaching on building a foundation. We all know it – build your foundation strong and then you can scale things up. But you have to build your foundation first. So now maybe you are thinking, well, where do I get the foundation? And I have a few things to say about it. You see, alot of what other people are doing just doesn’t work. They just think it does, because everyone else does it, so they think it must work. When I started putting all the pieces together and started making real sales with my own products, people began to ask me how I was doing it. So here’s what I’ve done, I’ve spent time to give you the foundation, step by step, exactly what to do and how to do it to start your information business and start making money with it fast, and pulled it all together into one place. I am calling it my “Complete Information Marketing Master Blueprint” – and that is truly what it is – the master nuts and bolts to get your info business started now – in any niche – so that very quickly you can start selling your own information products – your ebooks and recordings – and start making money online. And there is no magic, no fluff. Just step by step information – exactly what you need, and only what you need, so you don’t have to wade through extra stuff. My complete master blueprint will show you, in just 8 easy to understand steps, exactly how to start and expand an information marketing business in any niche, from scratch. There are over 5 hours of detailed, intense training in this program, and it is organized in an easy step by step method. I also provide you with PDFs and templates to give you that little bit of extra help. Just go through each of the steps and quickly set up your new information marketing business. There is a low success rate among people wanting to start a business online. Either no one tells them the truth – you must create your own products to really succeed. Or the thought of creating products is just too daunting. Not so with my master blueprint and method of product creation! * Discover my information marketing blueprint and why it is the easiest and most suitable online business model. * Learn how to find which niche will suit YOU best. The questions to ask yourself to find out if your chosen niche will work or not. * Find out the exact places I go to find out what my market wants to buy. * Where to find your potential customers. * My suggested action plan to help you focus in on the topics and material for your product creation. * Discover plenty of ideas for creating products. * The fastest way to create good quality, information packed products. * My suggested action plan will shock you into fully understanding just how quick and easy my product creation method really is! * My complete PDF guide showing you exactly how to set up your website and squeeze page. * You get access to my squeeze page template to use yourself. * Learn how to upload your files and much more. * My suggested action plan will see you having your first campaign all set up and ready to go in no time! 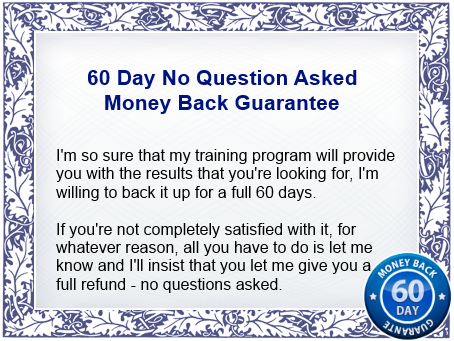 * I reveal where all the quality traffic is and how to get it – instantly! * My suggested action plan will explain what you need to do to start bringing traffic to your campaign and how to find your best traffic source. * My suggested action plan will see you having a 30 day email campaign up and ready and you will have ideas for your next product! * If you run out of ideas I reveal where to go to get loads more content and product ideas – you’ll never run out! * I provide you with plenty of ideas on how to scale up your business. How to create your own CD series or home study course that you can sell for between $100 and $500. Now, what does all that mean for you? It means that you can literally do step 1, then step 2, then step 3, and so on, knowing exactly what your next step is, not having to guess at anything. Is This The Kind Of Online Business YOU Want? This is everything you need to get started, every step of the process, and the exact correct order that each thing goes in the process. The bottom line is, one of the reasons you are not making the money you deserve online is that you don’t have the right products for sale to your market. OR you don’t know how to communicate with your subscribers so that they trust you and will buy from you. Of course, in your case, it could be any or all of those reasons. The thing is, it will feel great when you have it all figured out, right? And that’s exactly what my training will do for you – figure it out for you, show you exactly how it should be, in 8 simple, easy to follow lessons. How will it feel to finally have it all figured out, to finally have a working online business? How would you feel if 3 months from now (or sooner if you work hard) you have an ebook and a CD series or home study course for sale to your list? How will it feel to have double, triple, or even quadruple the number of subscribers you have now? How will it feel when you have a 100% operational online information business up and running? How Would It Feel To Own A Business Like That? Would it be worth it to start now, and get on the right path to making a full time income online? Of course it would – it would feel wonderful to have a sustainable income coming from your online information business, wouldn’t it? Now at this point, you might be thinking, So what’s all this going to cost, Kay? Ok, first of all, I want you to know that it is going to be very affordable. I want to help as many people as I can to succeed and so make it available to as many as possible. I’m not going to try to get you to “buy” it. By the way, I have no idea how long I will leave it at this price. But if you are still banging your head against the wall, trying to figure it all out, getting stuck every day, buying ebook after ebook trying to figure out one more step – go ahead, spend the $97 $77, download this today, and start learning from me tonight.